In November of 1880, the month after its formation, the Middlesex Fells Association wrote to prominent American landscape architect Frederick Law Olmsted asking his advice on the plan for creating a four thousand acre rural park in the wild rocky hills north of Boston. As it turned out F. L. Olmsted himself did not work on the Fells Reservation plan. He retired in 1885 the same year that Elizur Wright died. But in 1890 Olmsted’s protege, Charles Eliot, had begun to put together what became a successful movement to create the nation’s first metropolitan park system. When the Metropolitan Park Commission was established in 1893, Eliot, working with Olmsted’s two stepsons, was appointed to lay out boundaries for five reservations, including the Fells. The first parkway Eliot designed was a route to connect the Fells to Boston. Following Charles Eliot’s death in 1897 the Olmsted Brothers firm continued extensive landscape work in the Fells Reservation. 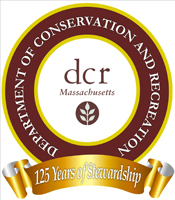 Thanks to the efforts of the Massachusetts Historical Commission today Fells Historic Parkways and the Fells Spot Pond Historic District have been listed on the State and National Registers of Historic Places, to provide protection to the legacy which has been bequeathed to us.